The CFI brings together teachers and creative professionals to explore new technologies such as Virtual and Augmented Reality, which will allow students to engage with them through purposeful projects that unite storytelling with innovative visual technologies. Ultimately, we want to create and research innovations in new media that foster an optimized teaching and learning experience. We achieve this through collaborations with both teachers and learners whom we network with. New media can offer important opportunities for both students and teachers. They are widely recognised to have the potential to enrich learning experiences of students and help teachers in transferring difficult to grasp concepts and theories to their students. Furthermore, New media technologies, like 360 video, graphic animation, 3D-modelling and holographic projections, offer the opportunity to personalize the learning experience such that content can be adapted to the needs of the student in terms of difficulty, learning effect, speed and much more. Technology has the potential to solve grand problems, but often introduces its own set of problems. It represents a new field of education that still has room for much experimentation. The focus of the New Media lab is therefore to experiment with new media techniques. The lab combining creatives such as 3D-artists, animators, virtual reality specialists and filmmakers the New Media Lab seeks to facilitate teachers who want to start experiments in their day-to-day education. The New Media lab aims to combine storytelling elements, media and educational content to create rich, dynamic learning scenarios and lesson materials. Storytelling, in fact, is the focal point of the Media Lab; it is in fact essential for any form of media, being the oldest forms of communication. The essence of what a great story is, is well known in (news) media, entertainment industry and film-making. The media lab seeks to learn from the underlying structures of these stories and apply the technique of storytelling in education. All of this with the clear conviction that storytelling has been and will be the foundation of teaching. What can you do in your classroom with Augmented Reality like Pokemon Go? Virtual Reality like the HoloLens? Have you explored 360 video? Recreate the past in virtual worlds? Can we use gaming in the classroom? How can we make each teachers a true storyteller with the help of new technology? What if a teaching assistant is a chatbot? And if the answer to any of these is yes, then what kind of unprecedented research opportunities exist in studying the effects of these applications on the human subjects? The New Media lab explores new visual and narrative technologies for use in the classroom, innovating education in the 21st century. 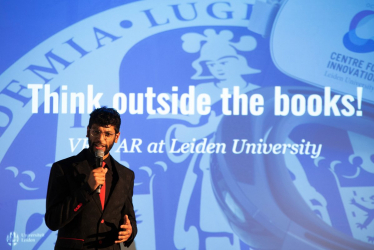 The New Media lab is part of the Centre for Innovation, a growth platform of Leiden University.